In a major policy reversal, State-owned electricity producer Eskom is budgeting to invest in the sustenance of mines that supply coal to the utility on a cost-plus basis. During Brian Molefe’s controversial tenure as Eskom CEO, the utility became hostile to the cost-plus model, which Molefe described as being akin to owning a bakery when it was bread that was required. 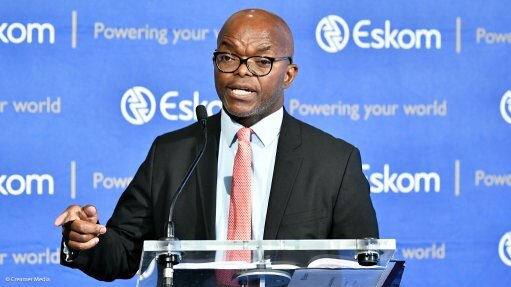 However, acting CEO Phakamani Hadebe, who was appointed in January as part of an intervention to arrest governance and financial decline at the utility following the election of Cyril Ramaphosa as African National Congress president, said on Thursday that buying coal “is not like buying bread at the shop”. Speaking in Johannesburg at a briefing convened to offer a system-balance prognosis for the high-demand winter period in light of low coal stock levels of seven power stations, Hadebe confirmed that stocks had fallen, in recent months, to below the 20-day target at the power plants. The power stations affected included Arnot, Tutuka, Majuba, Hendrina, Camden, Kriel and Komati. Stocks had, however, already been restored to desired levels at the Komati power station and, following receipt of a notice from the National Treasury providing Eskom with an exemption from normal competitive procurement practices, there was an expectation that stocks should be fully restored across the entire coal station of 15 fleet by November. Group executive for generation Thava Govender said that it was premature to provide an estimate for what it would cost the utility to replenish its coal stocks, but he acknowledged that it was likely to place upward pressure on the group’s 2018/19 primary energy budget. During its 2017 financial year, Eskom reported total coal costs of R58.5-billion as part of total primary-energy costs of R82.8-billion. Govender said that, should the additional coal be secured at between R400/t and R450/t, the utility’s coal costs might remain within budget, so long as it was also able to limit its use of the diesel-fuelled open cycle gas turbines (OCGTs). Hadebe acknowledged that Eskom has made increased use of the OCGTs in recent months, owing to reduced coal plant availability as a result of planned and unplanned outages, but dismissed reports that it had returned to spending R1-billion-a-month on diesel. For 2017/18, Eskom spent R320-million to operate the OCGTs, down from R340-million in the prior year. However, as a result of a rise in unplanned outages since January, partly the result of coal shortages, OCGT costs spiked in March at R68.4-million. The short-term coal replenishment plan for the six power stations that remained below target would involve a combination of shifting coal from stations that had surplus, as well as buying additional coal from various suppliers. Coal stockpiles across all Eskom’s coal-fired power stations currently stood at an average of 35 days, excluding Medupi and Kusile. The shortage had been triggered primarily as a result of non- or under-delivery of coal to the Hendrina power station from the Optimum mine, owned by Gupta-family-linked Tegeta. However, it was also attributed to the historical underinvestment at cost-plus mines. Tegeta controversially secured a R650-million prepayment from Eskom to enabled it to buy the mine out of business rescue. The previous owner, Glencore, placed the operation into business rescue after Eskom refused to negotiate an increase in the R150/t fixed-price contract. The failure of Optimum – which is again in business rescue – to meet its delivery commitments had a knock-on effect on stocks at the other power six stations. Currently all coal being supplied to Hendrina is being trucked in, but Eskom is also concluding an interim coal supply agreement with the Tegeta business rescue practitioners to enable coal supply to the power station while the business rescue process is in progress. The utility had also suspended power station and primary-energy managers at Hendrina after it discovered stockpile-reporting irregularities that had precipitated and accentuated the current shortfall. It had also since conducted an aerial reconnaissance of coal stocks at its other power stations to confirm that the irregularities were not more widespread. Govender said the survey confirmed that the other stocks were being accounted for correctly. Despite the shortage of coal Hadebe insisted that load-shedding was unlikely during the upcoming winter period. However, Eskom still needed to shore up its coal supply for future operations, as it currently only had 84% of its coal contracted up until 2025. In addition, at current procurement rates it was estimating a 15% yearly shortfall against its production and stockpile targets. To close the gap, Eskom would pursue a three-pronged coal procurement strategy that had been endorsed by the National Treasury and the Department of Public Enterprises. The strategy included giving priority to the recapitalisation of its cost-plus mines; the selection of bidders to supply it with an addition 100-million tons of coal over the coming five years; and finalising the 60-year coal-supply contract for the Kusile power station, which is being built in Mpumalanga. Senior manager integrated planning Andre van Heerden reported that Eskom was currently evaluating responses to a tender for the supply of 100-million tons of coal, but that these contracts would not be in place before the 2019/20 financial year. The tender for the Kusile coal-supply contract had also closed and Van Heerden reported that negotiations with potential suppliers were about to get under way. He stressed, though, that Eskom was not aiming to secure 100% of its coal requirement to 2025 so as to ensure that it did not “over commit” at a time where there were a number of uncertainties over the long-term future of a number of the coal-fired power stations. Coal contracting, he added, was an ongoing process, with Eskom having concluded 23 contracts for 2018, which vary in duration from six-month contracts to 12-year commitments.